It’s an exciting new week with new designs to start making! As I mentioned in my last post, a local gallery has asked to carry my work and I’m pretty much up the wall with excitement. I’ve never been carried in a commercial art gallery so this is a new and wonderful experience! 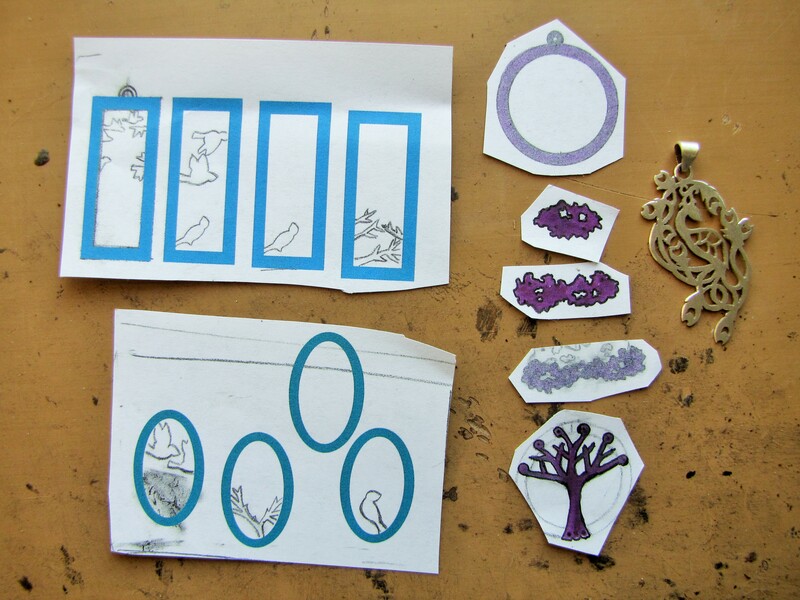 Since it started with the Birds pendant (Check out the process of making that pendant here) I have two similarly styled pendants, plus a tree and a (fairly) simple peacock. Yup, these are still images I’m obsessed with! When I’ve sold jewelry before it was the phoenix design that everyone wanted. I ended up making something like ten different variations on the phoenix. In a way it was kind of rough – after making so many in a short period of time, I lost some of my gusto for the image! But on the other hand, it taught me a lot about design. Every idea has limitless options and more than one of them can be right. It was also a lesson in customer relations. Everyone likes different things. And almost everyone likes something unique. That’s one of my favorite thing about handmade jewelry. It will always be unique, whether it’s by accident or on purpose. To me, this gives handmade pieces more life. It’s one of my favorite things about finding new jewelry artists (and any artists!). Their pieces have an individuality you will never find in machine fabricated jewelry. Knowing that someone put their personal time, effort and touch in every aspect of the piece makes it special. And please imagine the floor in a similar condition as the table top. This is actually a fairly clean day for my studio corner. 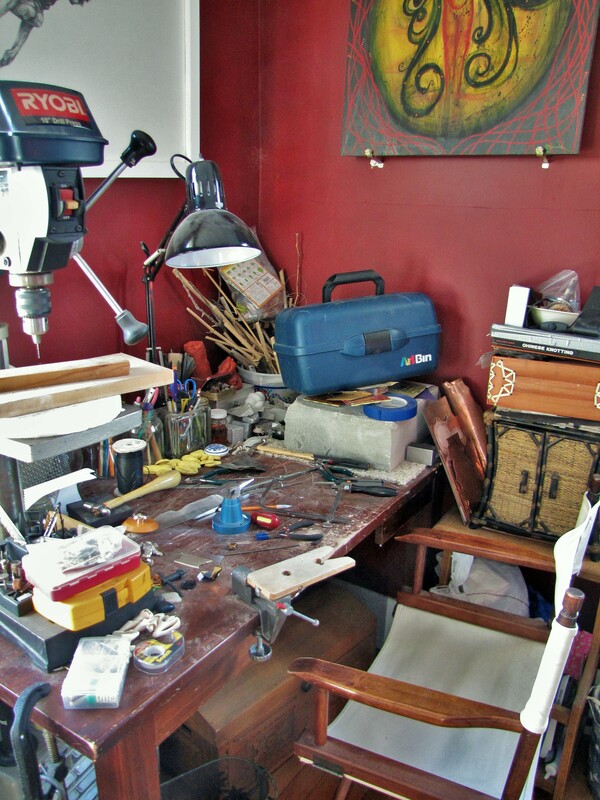 I’m sure there are artists who only work in pristine studios where everything has a place and is returned to said place as soon as work is done for the day. I’ve never quite been able to manage such refined organization (and I’ve tried!). I tend to get really focused while I work and forget about the little things, like where I put my tools after I used them (until I need them again!) or, occasionally, when I last ate a meal or when I was supposed to be at work! As a result, my studio space is more like an invasive weed that spreads out from my desk and across the floor of my apartment. I like it like that. It feels like a home that is well lived in and always welcoming. Well, my studio is calling! Next week I’ll have the finished pendants (which will help make sense of the disparate designs above) and hopefully some new insights about making jewelry to sell in a gallery setting! Haha, yeah, somehow the messiness never fails to make me smile!